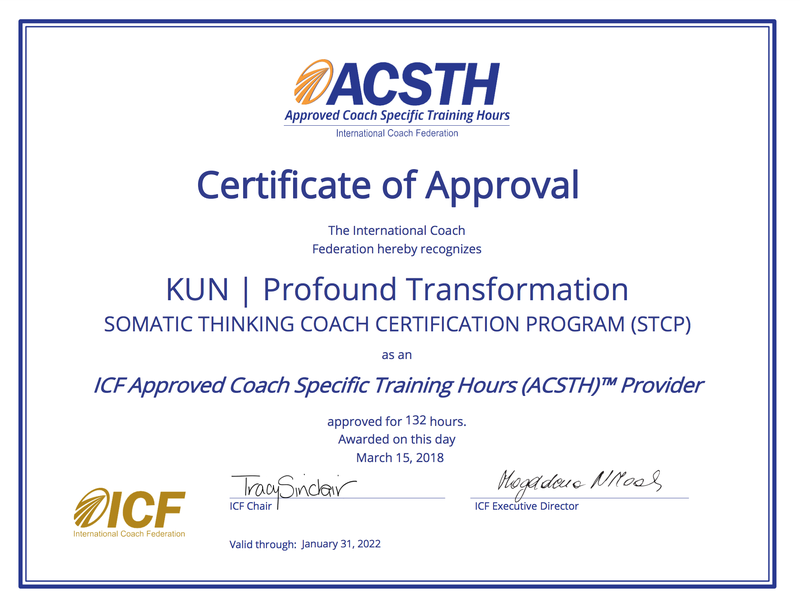 The first module of the Somatic Thinking™ Coach Certification program (STCP). It is composed of a robust and rigorous foundational curriculum that includes an immediate and direct application of the Somatic Thinking™ coaching methodology. This first module is designed for anyone who wants to learn how to coach using our Somatic Thinking™ methodology effectively. This module is also for coaches, therapists, and leaders who want to add a meaningful and powerful boost to an existing successful practice that is calling for renewal and regeneration. 1 Individual coaching session. Once you complete your registration a link will be sent to you so that you can book your session before the begining of the group sessions. 1 Individual coaching session before the group sessions. 1 Individual coaching session. Book your one-on-one session at your convenience.